kava-kava or kavais a crop from the western Pacific, the scientific name for Kava is piper methysticum, other names include ava, sakau, awa, kava pepper and yaqona. 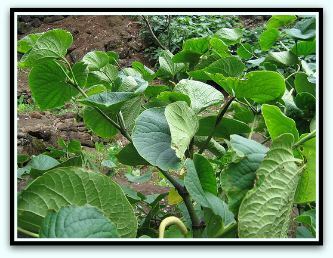 The kava shrub generally flourishes in well-drained, loose soils. It grows naturally in places that have a lot of rainfall. Too much sunlight will be damaging to the kava shrub. Kava's active chief elements are the kava lactones, all of the 15 identified are considered psychoactive. Only six lactones produce effects that are noticeable, but their concentrations within awa plants vary. Different ratios will produce different effects. Awa is used by some people to relieve sore throats. Awa is chewed at the rear of the mouth for around 5 to 10 minutes while the saliva is swallowed. Awa produces a numbing effect on the tongue and throat. It is also used for insomnia, anxiety, stress, depression, headaches, menopausal symptoms, urinary tract infections, asthma and muscle spasms. There is a great respect for kava in the pacific; it is used for political, religious, social and cultural purposes throughout the region. In Vanuatu awa is consumed at night time at village clubhouses which are called nakamals. Many of these places are only open to men. At these places there is more of emphasis on consuming awa for socializing and recreational purposes. In Fiji, awa is also called yaqona or grog is part of the fabric of life, drunk nightly by families and also used for important political and social events. The importance of the kava in Fiji is not so much physical, but a psychological event where stories are told and jokes bantered. It is often seen as a peace pipe between quarreling groups. 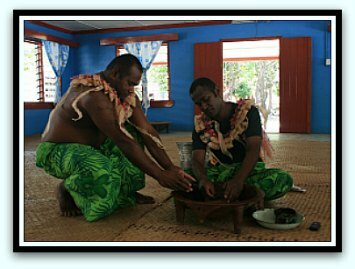 The photo on the right shows two Fijians making kava. Kava is drunk on all important occasions, including funerals, weddings as well as all church related functions. When a new chief or king is installed he must take part in an ancient awa ceremony to make everything official. It is also drunk at night time in clubs; only men may drink the kava. The rhizome and roots of kava are used to make topical solutions, capsules, beverages, extracts, and tablets. In Australia researchers from the University of Queensland found that a traditional extract of awa to be effective and safe in reducing anxiety. The South Pacific Journal of Natural Science published research by Aberdeen University researchers which showed Kava methanol extracts can kill ovarian and leukemia cancer cells in test tubes. Three months of heavy kava usage may cause a yellow, scaly skin rash and eye irritation. Concerns about liver toxicity in those who used dietary supplements that contained kava extract resulted in Kava being banned in some European countries. However a study done by researchers in Australia found no signals of any potential liver damage in those that participated in the study. Currently Kava is banned in the UK, Switzerland, Holland and France. There has been a lot of controversy about kava kava side effects but the bottom line at the moment is that there is no evidence that moderate use of kava kava causes any problems.